We will enjoy Dry Tortugas on the way and wait for a weather window. Check out our blog if interested. Where can I find the blog? We have a delorme for those interested in our exact routes, speeds, etc. We will enjoy Dry Tortugas on the way and wait for a weather window. A great trip and a great destination! An experience to amaze when doing that passage to Isla Mujeres is to be bopping along in the middle of the night, everything quiet and peaceful, and then to have a cruise ship come barreling along, lit up like the stadium in "Apocalypse Now" and with a bunch of inebriated passengers waving at you and shouting. Kind of puts things in perspective, so to speak. Your blog is 1st class! Great writing, pics and informative! Guess it will be some time before you get into cellular range to up-date us on your trip to Fort Jefferson. Cuba on your go-to places? Looks like Sat. night is the time to make the jump. You might want to think about removing that Bahamian courtesy flag. At the very least before you get to Mexico. Sea life, I was directly in front of you for the last few days here in Key West Bight Marina. When I saw you post this morning I planned to go over and say hi, but you pulled out before I could get there( I am on D dock). Anyway, fair winds in your travels. We made our trip to the Tortuga's on New Year's Day and had a great time. Look for the Goliath Grouper after dark in front of the Ferry dock area, especially if you have an underwater light. We saw six, some maybe 300 lbs. Looks like Sealife is snug at anchor in the Dry Tortugas! Scott & Caroline have been enjoying their stop in the Dry Tortugas. Tonight should be especially fun with 40kt winds predicted. Here's their side of a few messages from today. "Going on scorpion walk tonite, if front holds off that long. Barometer is diving hard! Doing OK on food and booze. Pretty much out of ice though, too cloudy for excess solar. Ferry sells a small bag for $7. Not that desperate yet." Scott & Caroline have been enjoying their stop in the Dry Tortugas. Tonight should be especially fun with 40kt winds predicted. Whoa! Not a lot of protection there! We'll see how their anchors perform. And if the usual low-budget sailboats are there, that might make for an interesting night. Assuming they are anchored in front of Fort Jefferson, of course. They're in front of the fort. I asked Scott about going to Cuba but they aren't insured. A sailboat from Denmark just pulled in. F.....s are probably going to Cuba, but I'll try to find out. These are from 2 days ago. Since they are in front of the fort, and since the strongest winds tonight are going to be from the SW, working around to the NW, hopefully the fort will offer some protection. Still going to be rough, though. Fingers crossed. "Going to try to get some sleep…been a long night. Peaked at 56kt gust, 40-45 sustained. Currently 35 sustained gusting 45. 2-3 ft. Whitecaps in anchorage." Off topic, but I bought and igloo ice maker from Walmart and it was the best thing when we went to the Bahamas. Ice is not cheep when buying just frozen water. We anchored at Bird Key rather than Fort Jefferson. It seems at first more exposed but the holding is better and ironically much of the time the waves are less even though very open to the wind. However, the week before we were there and the week after the conditions were quite unpleasant. To me Dry Tortugas is a place you look at conditions and decide whether to go from Key West or not based on current conditions. Quick hops there and back, but hard to depend on longer windows of comfort. Your window doesn't look very good for the next few days. Frankly, I'd head back to Key West and get some relief and sleep while waiting for a window to start again. Love yawls' blog and will follow for inspiration. 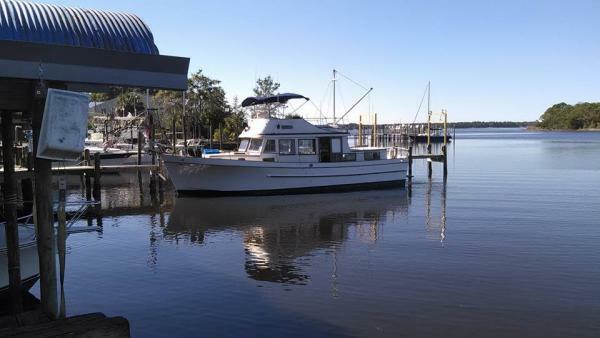 Jenny and I just bought a 44' trunk trawler and after 3 weeks of work including a head job on the port engine we are bringing it back to Charleston SC from Panama city FL. Then she's going on the hard for year like Sea Life. Then we'll be seeing you two somewhere sometime..........safe travels and keep us updated!! Sealife is off and running from the Dry Tortugas. Looks to be off the western edge of Cuba heading into the Yucatan Passage. I wonder if that cold front pushed that far south giving them some nasty seas. Good luck and fair sailing! He should be encountering mostly 3-4' right now. Sounds like he may have escaped the US weather just in time. The area he left is 4-7' tomorrow. Wind forecast for Mexico has winds in the 20-gusts to 26 tonight into Tuesday morning then calming to 10-15 Tuesday afternoon. Later in the week winds and seas pick up considerably. Looks like thy hit it about right for their passage. Sure hope the cold front is not that far south. The Yucatan Channel with a wind with northerly components in it can be a real bear! Good anchorage right there on the west end of Cuba to wait weather, though.